Lately I’ve been dreaming of taking a vacation to a tropical destination. A place where the only decisions that I will have to make are sun dress or bikini, margarita or piña colada. Since this dream vacation isn’t quite a reality yet, I decided to settle for wearing tropical inspired fashion to get me through. This palm print skirt was the perfect remedy. I used the skirt as a base for the look and wanted to tie in some bright colors. 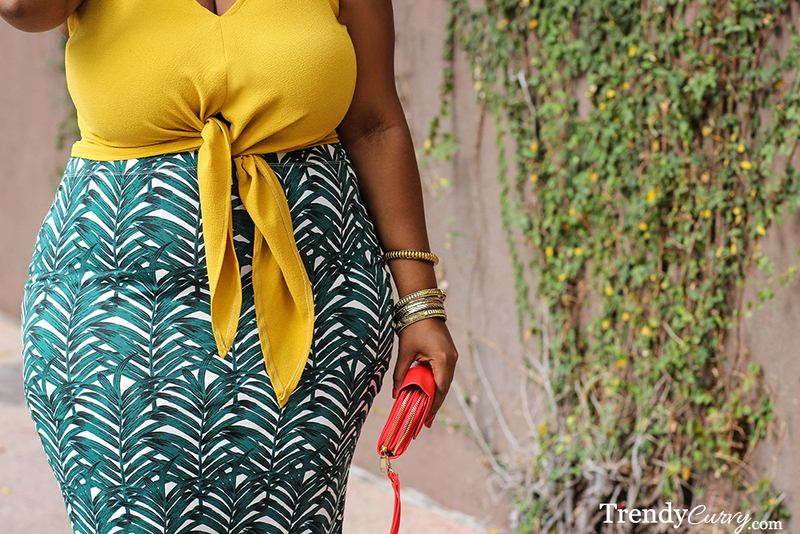 I saw this twist tie yellow top from ASOS and knew that it would help complete the island vibe that I was going for. Complete with mirrored aviator sunglasses and high heel sandals, this look is ready for tropics! I love this look. The colors are fun and the twist tie top is so cute! It makes me want to head to the beach. Thanks for sharing! Wow …waht a super charming look!…You’re the Queen of the Tropics indeed! Love it. I never shop the regular size clothes but this top looks great. Maybe I should look on that side too!